An irresistible eyeshadow pocket from W-LAB. A brand from Korea and thanks to Althea.Kr for introducing so many good Korean products. Hehehee.. This eyeshadow palette called W'Lab Pocket Shadow in Blooming. Packaging: It comes in a white sleek packaging and I kinda like it. The name pocket shadow does match with the packaging as it is small and travel friendly. As you can see in one eyeshadow palette, it consist about 10 different colors. In one glance I know all of the color is define what Korean makeup is. At the back of the packaging you can see the code name for each eyeshadow colors. All the colors is in the eyeshadow palette more ot golden goddess style. It is an ultimate version of feminine makeup look. Previously I used more like a brown, dark brown, maroon and several bold colors. But in this eyeshadow palette it is more like a shimmer gold, bronze, rose gold, light pink and more to light color. This eyeshadow palette consist of 7 shimmer and 3 matte. When I swatch each of color I was like "wowww!". especially the shimmer, All the shimmer color in this palette really easy to glides and build-able. All the color pretty and turns out pretty well on my skin tone. 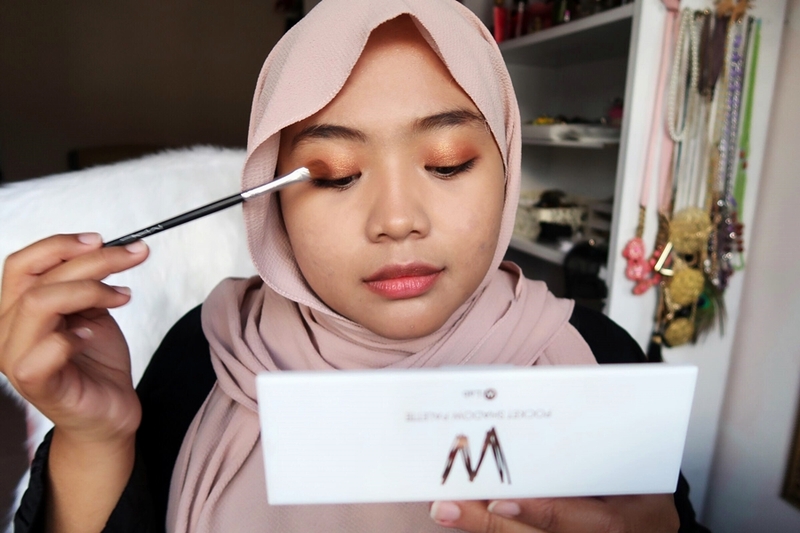 But the matte color quite down side to me because when I apply it the color seem almost similar to my skin tone as it does not pop-out that well on medium skin tone. It might pop-out nicely more to light skin tone. This is me just get ready and playing around with W-Lab Pocket Shadow Palette - Blomming. What I find interesting about it is the color selection. The color is beautiful to be apply on its own! You can pick one color and apply it all over the eyelid and the color will turns out beautiful. 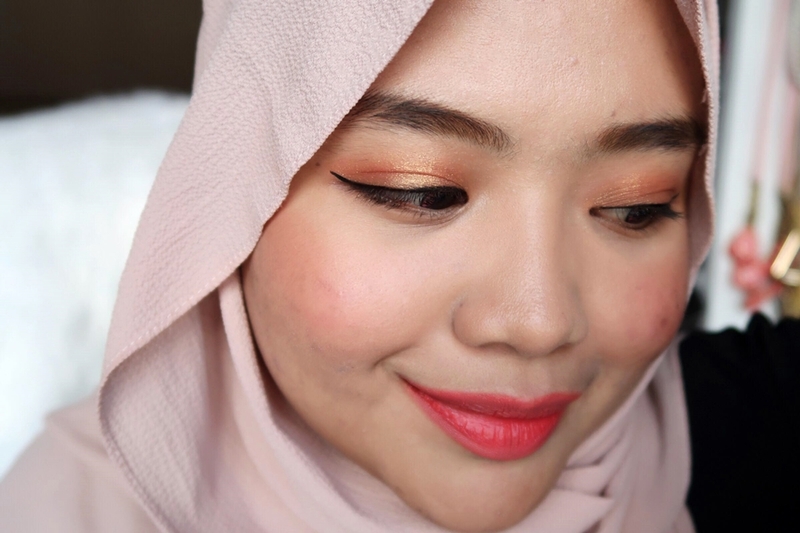 Well, you still can still go for a smokey eye look or what-ever-eye-look you want but I just want to mention that it still pretty with only one color application. Here the close up look on my eye. I only apply Kaffir Lilly on my eye-lid. This eyeshadow palette does embrace the Korean makeup look vibes to it. Overall, I love the gorgeous colors in this eyeshadow palette but the only down-side is the matte shades because it does not really pops-out on my skin tone. Maybe someone who fairer will be beautiful. If I need some shimmery vibes, I'll definitely go with this palette as I can create a goddess's eye look with it. Wuuuhuuuu.